Bread and Butter 3 plates in Americana Style House Ironstone by J&G Meakin England 1976. 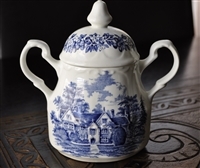 Sugar Bowl & Lid in Romantic England Blue by Meakin. Covered Vegetable from J&G Meakin, Hanley, England. Blue Nordic Ironstone 25 piece set from MEAKIN J. G.